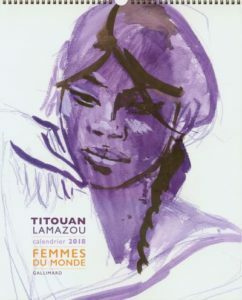 To mark the 10th anniversary of the Femmes du monde exhibition, which drew 200,000 visitors to the Musée de l’Homme and was extended three times, the 2018 Titouan Lamazou diary and calendar (Éditions Gallimard) gather his most exquisite portraits of women throughout the world. The Femmes du monde project sketched a picture of the world through over 200 portraits of women testifying to the diversity of beings within the communities visited. This diversity is reflected by the palette of Titouan Lamazou, whose work ranges from the simplest off-the-cuff pencil drawings, to more elaborate paintings, right up to photo-tableaux that employ the most sophisticated digital techniques. Daisy, Blessing, Kobra as well as Khadi are among the 52 portraits selected by Titouan Lamazou for this 2018 diary, a genuine invitation to see the world.